I’ve always thought it would be great to be an editor. In my fantasy (yes, these are the things I fantasize about), I would write a novel and then put on my editor cap and edit it. All by myself. But as any writer (or editor) will tell you, these are two very different endeavors. I know many writers who admit to being awful at self-editing and many editors who would never dream of crossing into the writing realm. 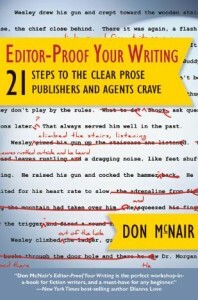 That’s why I was intrigued when I was offered the opportunity to review Don McNair’s new book, Editor-Proof Your Writing: 21 Steps to the Clear Prose Publishers and Agents Crave. It made me wonder…could I straddle both worlds? The blurb on the cover promised a “workshop-in-a-book”, so I used it that way, putting its lessons to work on my current manuscript. The first thing I noticed was how quickly my word count started dropping. Most writers spend their days trying increase word count, but this shrinkage was a good thing because it meant that I was eliminating words that were, as McNair puts it, fogging up my writing (like -ing words, infinitives, prepositional phrases, throwaways, etc.). Prior to reading this book, my one steadfast rule was to avoid adverbs (a.k.a. -ly words), but that’s just one of 21 types of problematic words and phrases McNair identifies. When I think of “editing”, grammar rules and spelling lessons jump to mind, but there’s more to it than that. As writers, we strive to be invisible storytellers, however, from time to time we unintentionally remind the reader that we’re there, lurking in the background. Whether it be expressive dialogue tags, poetic descriptions, or well-intentioned adverbs, Editor-Proof Your Writing exposes the unknowing ways in which we barge in on our readers and distract them from the story. This book is packed with tips to strengthen your writing and can serve as a guide through the (sometimes painful) revision process. If you’re a visual learner, like me, you’ll appreciate the Before and After writing samples that illustrate the concepts. And every chapter ends with an assignment or exercise, so you’ll have plenty of opportunities to put your new skills to use. When it comes to writing and editing, I suppose it is possible to successfully straddle both worlds. But for now, I’m going to stay on the writing side of the divide and take comfort in the fact that, with this book in my arsenal, my editor’s job is about to get a lot harder. For more information about Editor-Proof Your Writing, visit Don McNair’s website. Disclosure: I received a copy of this book to review but I was not financially compensated in any way. The opinions expressed are my own and are based on my observations. It’s possible to be both an editor and a writer. I do it, but I never edit my own work until after other people have looked at it. It’s too hard to edit anything you’re close to. This book seems like a really good resource for those revision stages, though.